Frontal and side views of the bronze statue, which is located at the Admiralty Arch end of the Mall. 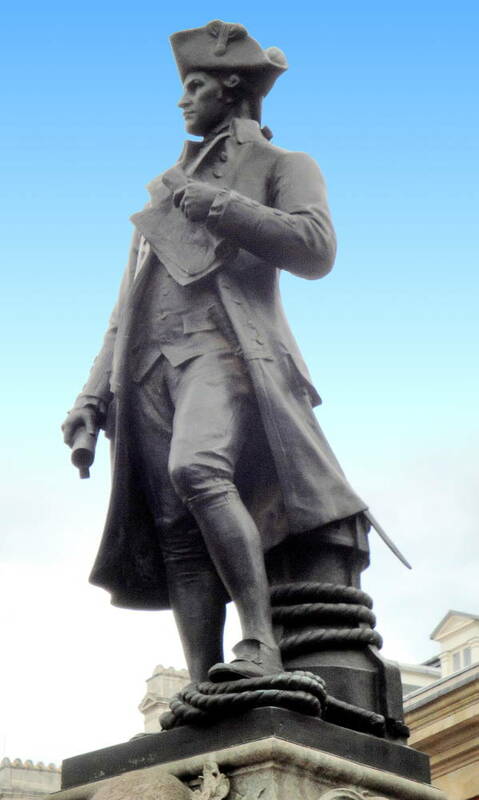 On 3 November 1908 The Times published a letter from the recently retired Premier of New South Wales, Sir Joseph Carruthers, deploring the absence of any commemoration of Captain Cook in London. 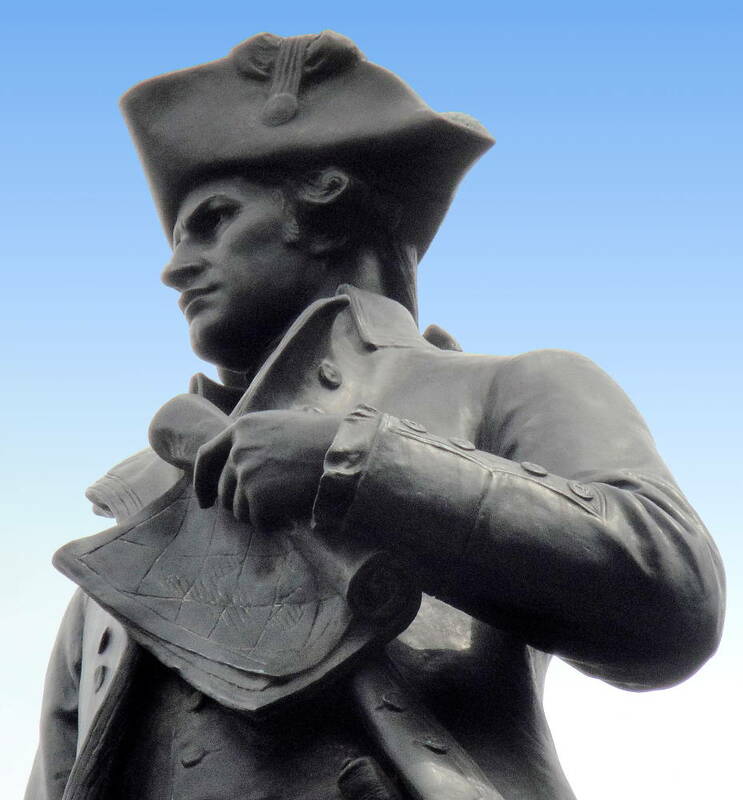 The British Empire League took up the challenge and a memorial committee was established to raise funds for a statue. On 15 March 1911 the Office of Works offered a site in The Mall on condition that Thomas Brock should be the sculptor. 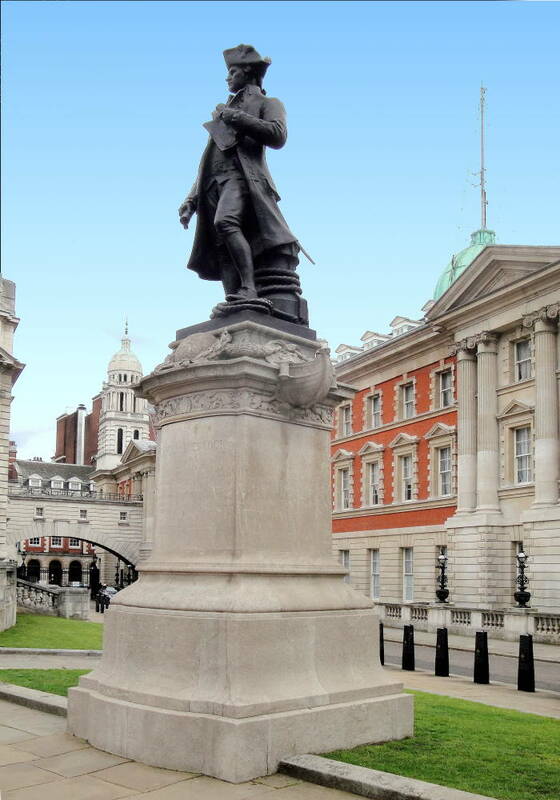 This was to ensure that the statue would be ‘in harmony’ with Brock’s statues of Gunnery and Navigation on the nearby Admiralty Arch. King George V approved Brock’s model in February 1912 and the statue was unveiled by the King’s uncle, Prince Arthur of Connaught, on 7 July 1914. Winston Churchill, then First Lord of the Admiralty, proposed a vote of thanks to Prince Arthur. Left: The statue in its architectural surroundings. Right: Detail with Cook holding naval charts. Two details near the bottom of the memorial. 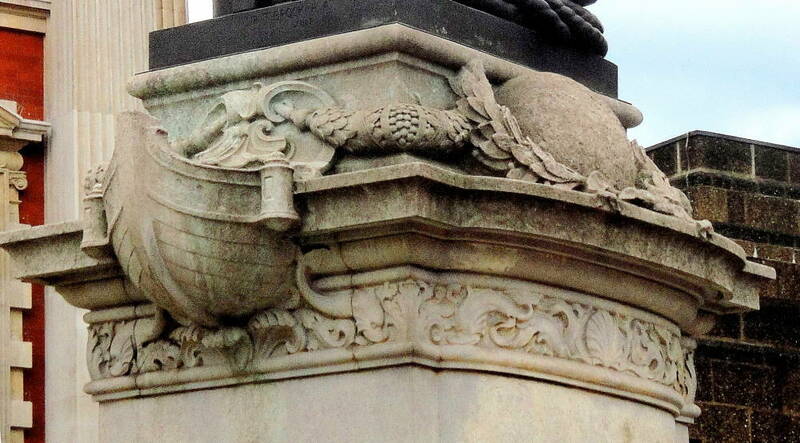 Left: Stone base carved with a ship's prow and what may be the globe across which he sailed. 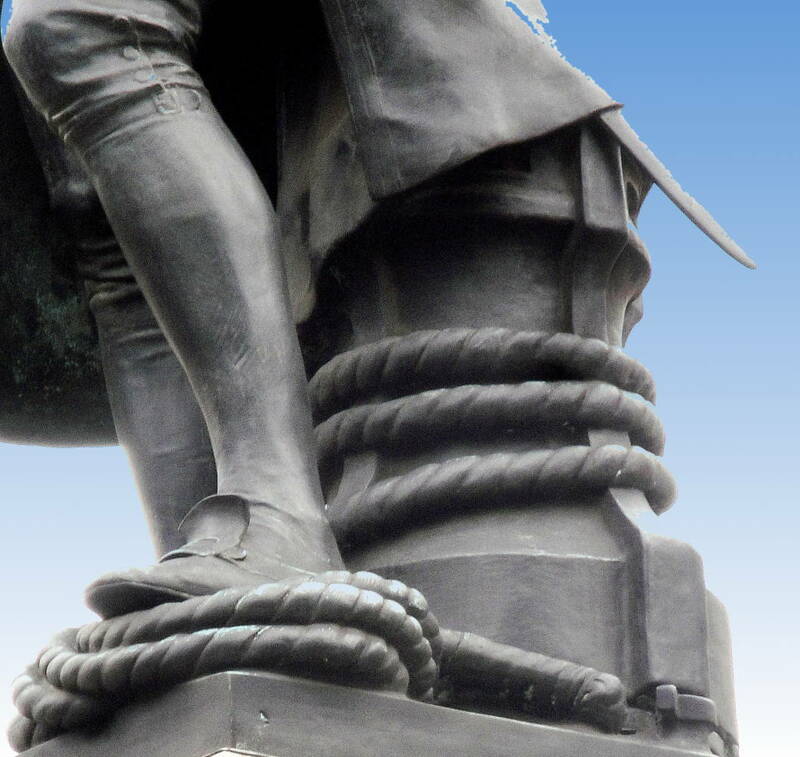 Right: Detail with capstan, rope, and Cook's sword. Byron, Arthur. London Statues. London: Constable, 1981. 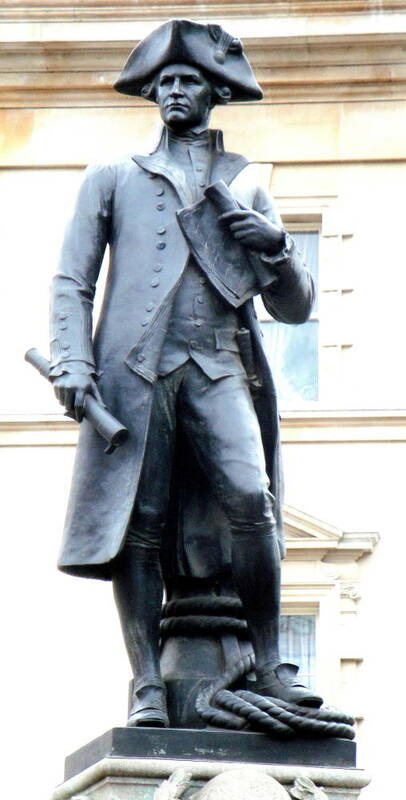 Ward-Jackson, Philip, Public Sculpture in Historic Westminster. Liverpool: Liverpool University Press, 2012. I, 139-41.